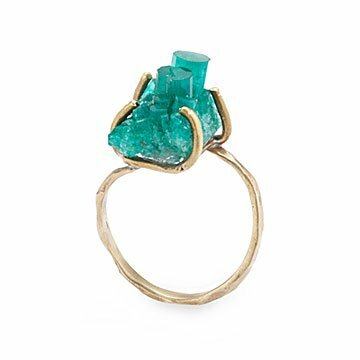 Emilie Shapiro creates vibrant gemstones using natural elements and pressure cooking them for 11 months. Pairing Mother Nature’s beauty with modern technology, these vibrant gemstones were created using natural elements that were pressure cooked for 11 months. This sustainable process creates gorgeous rough-cut stones that Emilie Shapiro then sets in recycled brass fittings. Each piece is slightly different thanks to the uniqueness of the crystals. Handmade in New York City. Make it a set! Click here to see the matching Emerald Crystal Necklace and Emerald Crystal Earrings. Avoid harsh chemicals, wipe clean with a damp cloth, store in jewelry box.